John Casey specializes in 19th and early 20th century American literature and culture, Veterans Studies, and Environmental Humanities. 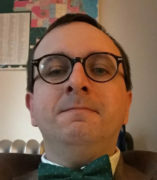 He is the author of the book New Men: Reconstructing the Image of the Veteran in Late-Nineteenth-Century American Literature and Culture (Fordham, 2015). This book examines the fictional representation of soldiers returning home from the battlefield in the Civil War Era United States. He is currently working on a book analyzing the symbolic role of the family farm in debates over immigrant integration in the United States during the nineteenth and twentieth century as well as articles on the impact of drones on the aesthetics of war literature and narratives of the Vietnam War by Vietnamese soldiers. He has taught general education literature and first year writing courses at UIC as well as entry level courses for the undergraduate English major and minor. He has also served as Assistant Director of English Undergraduate Studies, Assistant Director of First Year Writing, and Interim Coordinator of Graduate Studies.